Today we’re looking at the REI Camp X chair. We just picked up a couple of these and they are really handy. We needed to replace a couple that were a little larger than the Camp X. These portable chairs are really actually fairly lightweight. I won’t get into those technical specifics because you can just look those up real quick but wanted to talk a little bit more about why we have it. 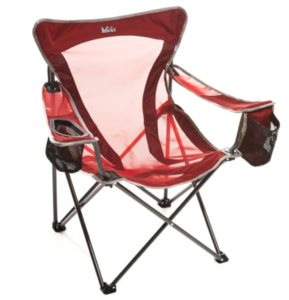 The Camp X chairs are really nice for camping in terms of car camping. You probably wouldn’t want to take it backpacking as it has a really solid frame, which is nice, but adds a little bit of weight, obviously. There is a water bottle or other drink holder / cup holder on the right hand side and another under the arm holder with velcro on the left hand side for some extra bits of gear. We really liked the lightweight aspect of it in terms of car camping – it’s easy to pack up and store or carry a short distance with the heavy duty carrying bag and attached sling. You can see on the mesh, it’s nice that there’s not a lot of additional weight but it’s surprisingly solid when you sit on it. The stitching also appears to be really solid and should stand up to use for quite some time. So far we’ve just taken them to the beach. We’re looking forward to taking these up into the mountains and a few different car camping trips, trail runs, and some other adventures. The price is right too we might have gotten these on sale, I don’t recall exactly, but it was about $35 each and right now there’s no real downsides we’re seeing. I think the only thing that you should know is that these would not be backpacking chairs. 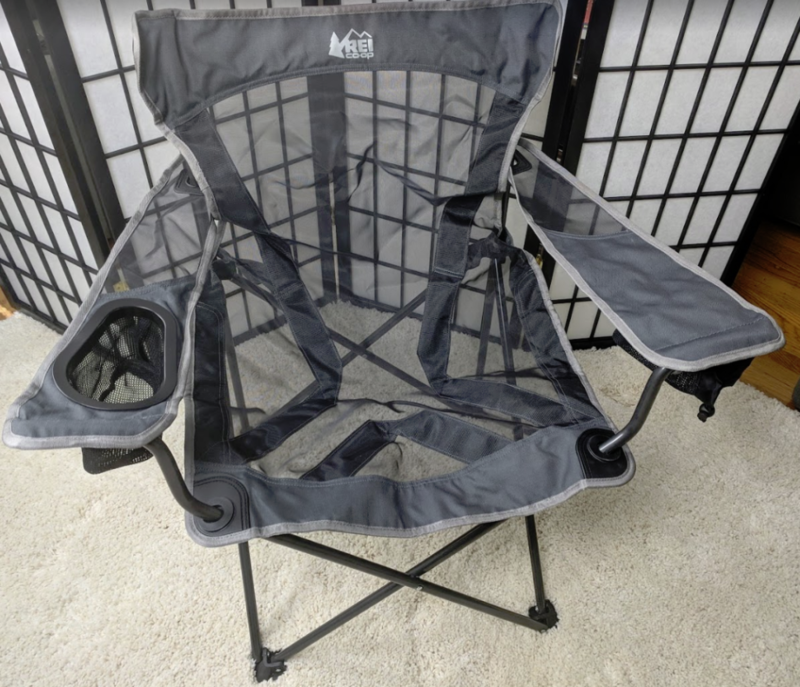 I think this is a solid choice for anyone who's looking for something like a beach chair, car camping chair, anything outdoor activity where you're not really overly concerned about the weight. It's also a great value for the price, solid quality from REI and something we're looking forward to using for the next couple of years.